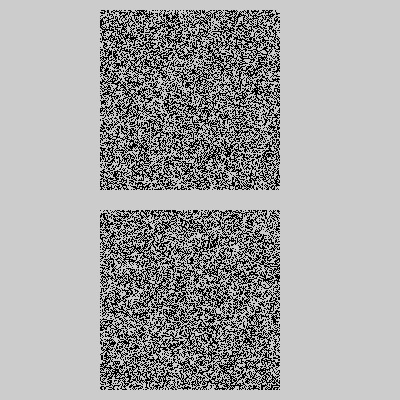 The above snippet demo's an alternative random number generator that uses the Tausworthe method. I don't actually know much about this, or fully understand how it works. I just saw it on a random reddit thread, googled about it for a few minutes and then ported it to actionscript. I stumbled upon a bunch of other random number algorithms, maybe I'll throw them in a class in the next couple days. This entry was posted in Number, misc and tagged actionscript, flash. Bookmark the permalink. Post a comment or leave a trackback: Trackback URL. One tausworth method looks a little better. notice the black banding at the bottom of math.random. Try multiple tausworth methods together, and google Central Limit therom. Also make a .wav file from your code and listen. you will be able to hear differences.